Fourth generation farmer, Olivia Lesher, reveals a typical day on her family farm, otherwise known as Way-Har Farms. Lesher is a calf manager on the farm. 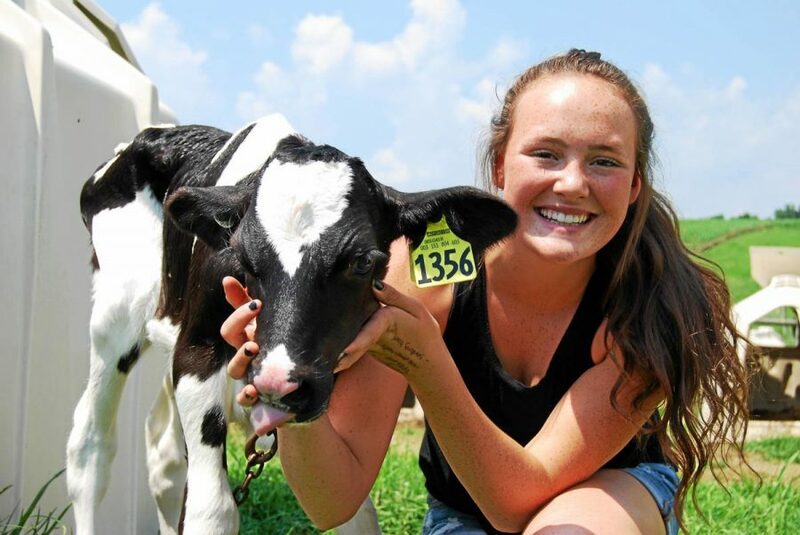 Her job is to “maintain the health and nutrition of the calves on the farm,” as well as handle vaccinations. For Lesher, after school, a typical day would start by bedding the hutches, or laying down hay in the cowpens, if needed. Afterwards, Lesher would feed the “three main barns of heifers,” and, ensure that there are no sick heifers. She checks to make sure the calves do not have a “loss of appetite, cold ears, fever, dehydration” or an inability to stand. “Sometimes it is hard to determine if a calf is sick before they show serious signs,” meaning it is very important to spend a lot of time with the calves, and “make sure they are all healthy.” Next, Lesher feeds each of the calves a gallon of milk, which is done twice a day. Lesher describes the process to making the milk, as well as the feeding process of the calves. After Lesher feeds the calves, she checks on an employee, who milks the cows, to see if he needs any additional cows from the new barn. There are three groups of cows, one of which is filled with sick or older cows, as well as recently calved cows. In said group, Lesher tends to the cows that require a daily medication or a vaccination. In terms of when Lesher’s work-day ends, there is not specific time when the work is complete. “Some nights are 7:30 p.m. or 1 in the morning.” Also, at times, Lesher is interrupted by the birth of a new calf. She needs to dry off the calf and give both the calf and the mother their vaccinations. One of the family’s main selling points is their hard dipped ice cream, where they sell over 50 flavors to eager customers. Lesher, however, is not too involved with the store, unless they are short handed. Overall, Lesher has a very important role on the farm and finds enjoyment in her job every day. While she is not a fan of milking the cows, as she prefers to work outside, which provides variation in her routine, she loves her role as a calf manager.